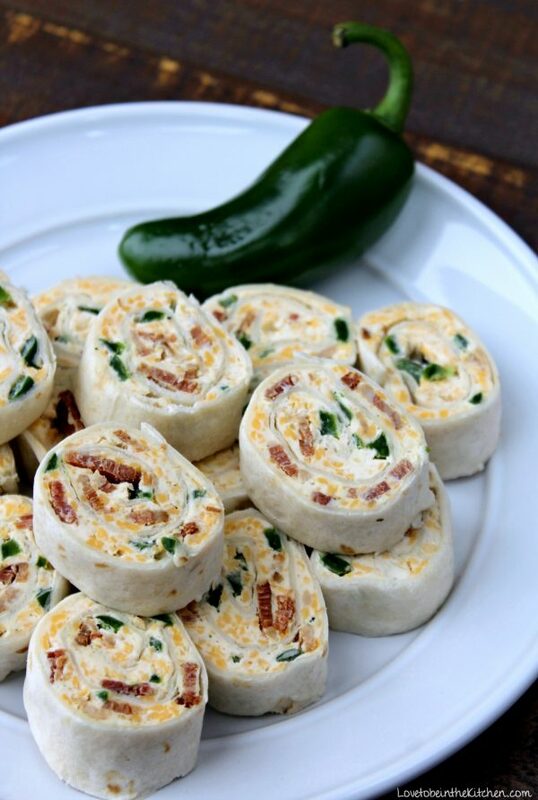 Jalapeno Popper Pinwheels are the perfect appetizer for game days, parties and more! An easy snack to prepare that can be made in advance and served either hot or cold. 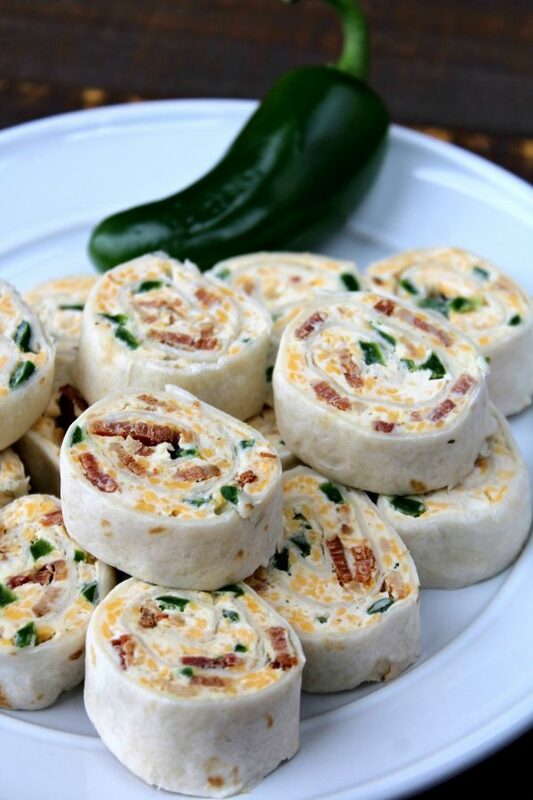 Flavorful cream cheese, bacon crumbles, cheddar cheese, and spicy jalapenos are spread on a tortilla, wrapped up and cut into fun pinwheels! This recipe is super simple and easy to prepare! I love that it can be made ahead of time too! You can either serve it hot (like in the above picture) or cold (like in the pictures below.) Both are great but I do like it baked the most as it gives it a crispier texture. The ingredients are simple but create magic together! Beautiful right? I’m sure all you foodies would agree! Mix it together and spread it on tortillas. 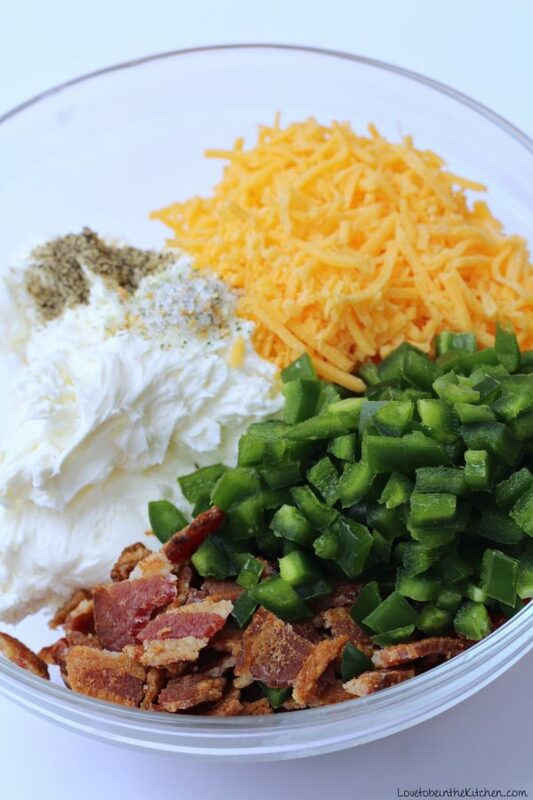 Wrap it up, chill, and then cut and serve! If you are wondering if it’s too spicy I would say it’s definitely not! I can’t handle too much spice and these are perfect for me! To make sure it’s not too spicy, cut the jalapenos lengthwise and remove all the seeds and white flesh, leaving just the green outside part of the jalapeno. 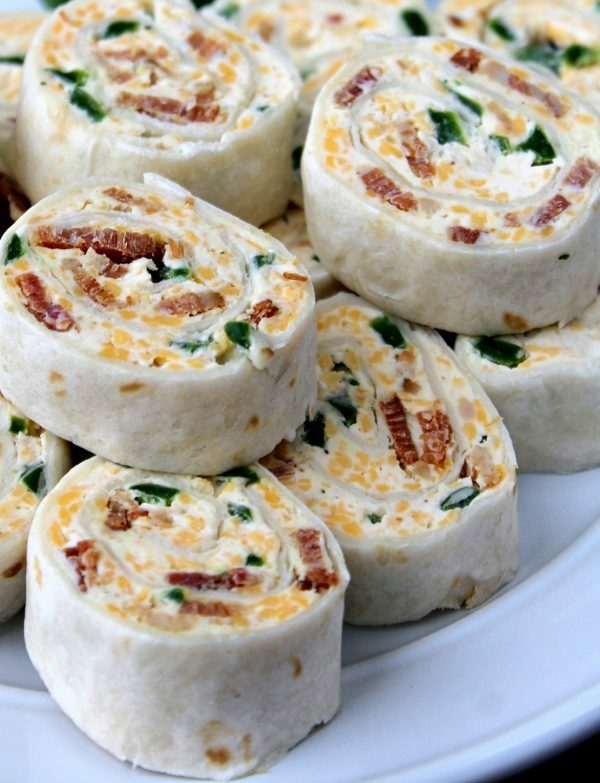 This is a must for your next Game Day party or any party! In a small bowl, add softened cream cheese. If you want it fluffier, mix with an electric mixer. 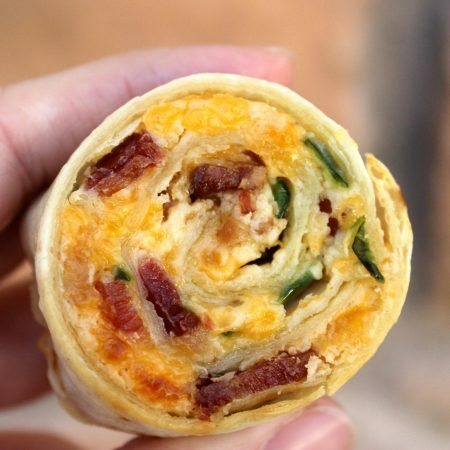 Add in the cheese, bacon, and jalapenos. Add in the desired amount of garlic salt and salt and pepper to taste. 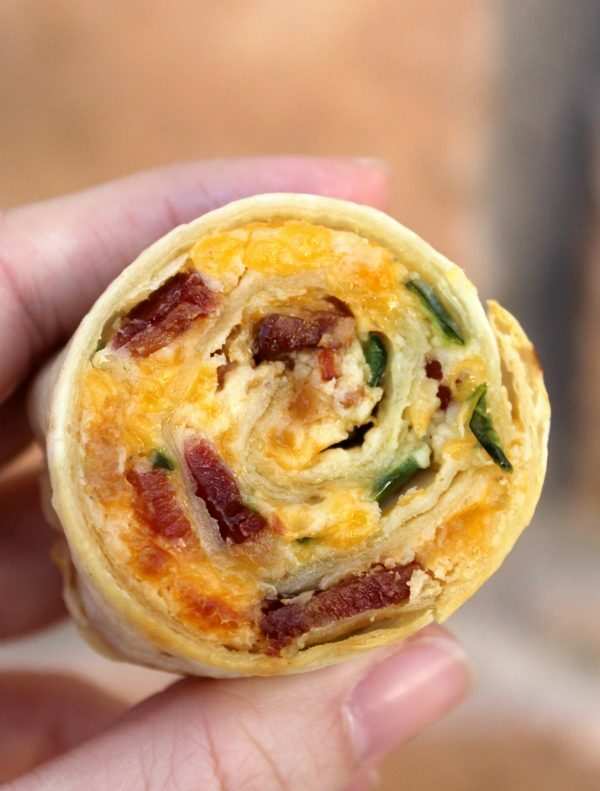 Spread in an even layer over the tortillas. 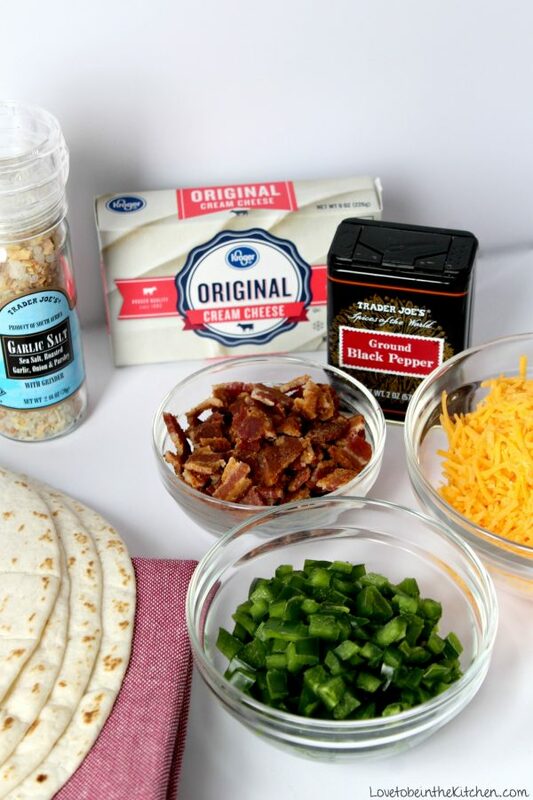 Roll tortillas tightly, wrap in plastic and refrigerate for 2 hours or overnight. Cut off the ends and cut each tortilla roll into 6-8 pieces. Serve cold or to heat up, bake at 350 degrees for 10 minutes on a greased baking sheet.